The original 435-hp 1969 Chevrolet Camaro ZL1 was a short-run COPO rocket ship, and it was the fastest model in the Camaro line. It was conceived by an Illinois Chevrolet dealer named Fred Gibb, who used GM’s Central Office Production Order (COPO) system to order 50 1969 Camaro’s, outfitted with the lightweight ZL1 427ci racing engine. This all-aluminum powerplant was 100 lbs lighter than a standard 427 big block, and it had a crazy 12.0:1 compression ratio. The official rating was 430-hp & 450 lb-ft, but many felt that figure to be very underrated. 48 years later, the supercharged 2017 Chevy Camaro ZL1 was once again the fastest pony car in the General’s stable. 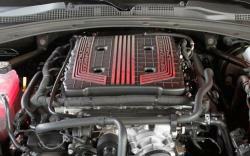 This was accomplished by exchanging the previous generation’s 6.2L LSA V8, for the 6.2L LT4 from the C7 Corvette Z06. A massive intercooled supercharger sits atop the big little small block, and shovels in enough air to produce a staggering 650 HP. That's enough grunt for this mad Chevy to hit a top speed of 202.3 mph at a test track in Germany. Not bad for Chevy that can also be had as a 4cyl rental car. track cooling pack adds high-capacity oil, transmission, and differential coolers to keep the temperature in check on track days. 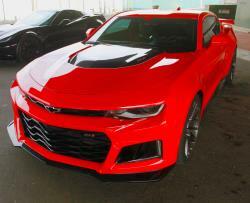 To improve handling, the six-gen Camaro ZL1 gets standard Magnetic Ride dampers, beefy springs, stiffer sway bars, a Performance Traction Management System, Driver Selector Mode w/ Launch Control & Line Lock (locks the front brakes while you melt the rear tires), an electronic limited slip differential (eLSD) in the Camaro ZL1 Coupe and a mechanical limited slip differential in the Camaro ZL1 Convertible, 6-piston Brembo brake calipers, 14.6 inch two-piece brake rotors, bespoke forged aluminum rims, super-sticky Goodyear Eagle F1 Supercar tires, and a unique aero kit that creates extra downforce at speed. Other notable equipment includes Dual Mode Exhaust, a special hood, ZL1-specific exterior trim, and unique cabin trim with deeply bolstered Recaro bucket seats. In order to feed that massive supercharger, air has to be brought in from outside the engine compartment and forced through a paper air filter to remove any airborne contaminants. 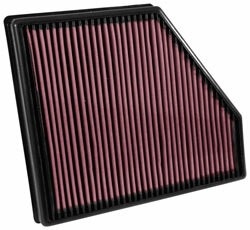 But the problem is, that OE Camaro ZL1 air filter can clog as a layer of dirt builds on the surface. This obviously reduces the amount of fresh air that can reach the supercharger, which can lead to lower horsepower and torque production. An AIRAID 850-047 replacement air filter, on the other hand, is made from multiple layers of cotton gauze and synthetic material, which are treated with a special oil to create a sticky web of the synthetic and natural fibers. This ‘depth loading’ design can trap the dirt particles, and hold them in place for up to 50,000 miles. The filter is also backed by the AIRAID No-Hassle Lifetime Limited Warranty, and installing one won’t void the car’s factory warranty either.